﻿ Cristiano Ronaldo: "I want to become the best football player ever"
06.11.2014 » Cristiano Ronaldo: "I want to become the best football player ever"
Following his superb journey last season where he scored 31 goals in 30 league appearances for Real Madrid, Cristiano Ronaldo has finally received the European Golden Boot 2013-14, an award meant to distinguish the top goal scorer in domestic leagues in Europe. In a ceremony held at the "Hotel Meliá Castilla" in Madrid this past Wednesday, Cristiano Ronaldo received the European Golden Boot award for the 2013-14 season, through the hands of the Spanish newspaper MARCA and the ESM (European Sports Media). 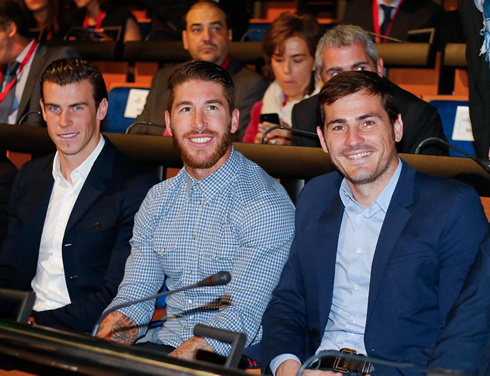 Attending the event were a few of his Real Madrid teammates such as the team's captain Iker Casillas, Sergio Ramos and Gareth Bale, as well as his mother Dolores Aveiro and the club's president, Florentino Pérez. Cristiano Ronaldo: "I wasn't expecting so many people in this room. I would like to start by thanking everyone, first my teammates, without whom nothing of this would have been possible. I'm also extremely grateful to my family, to the fans and to Real Madrid, who has given me this opportunity to play for the best football club in the world and to keep winning trophies. All the collective trophies are important of course, but so are the individual ones. I work very hard to all this...", started by remarking the 29-year old forward. Ronaldo: "Winning this third Golden Boot still makes me feel like I've won it for the very first time. I'm truly delighted and this is a very special day for me. I'm getting more and more valued each day that goes by and I can only promise the Madridismo that I'll always give my best on the pitch, with all the passion I have in my heart, my goals, assists and performances. I still have many years left to play for this club and I'll always give my all", promised the Portuguese star. Cristiano Ronaldo: "I always try to do my best and I don't do that only when things are going our way, like last season. I always want more... I'm well aware that my last 5 seasons have been great, especially the last two. However, I'm not satisfied with being only the best player in Portugal. I really want to become the best player ever and I'm determined to keep working hard in order to accomplish that. At the end of the day though, everyone is allowed to have their own opinion and their own preferences. As a footballer, my focus is to always try becoming the best in what I do and I firmly believe that, step by step, I'm leaving my mark in the history of this game", commented Ronaldo. With his contract only set to expire in 2018, it seemed logical to believe that there was no new agreement being forged or even on the table for Cristiano Ronaldo. The Portuguese player didn't confirm anything in that respect, but left the impression that he could be receptive to a new extension offer. Ronaldo: "I'd have to talk with Florentino Pérez in order to discuss a new contract, but I'm very happy with the way things are now. I'll be 33 when the current contract runs out, so I think we'll all have to wait a bit longer to see if the president will still want me to play here for a few more years", revealed the FIFA Ballon d'Or 2013 winner, just before he shared his view on the current Real Madrid squad. Cristiano Ronaldo: "Everyone is talking about this being one of the best Real Madrid squads ever, but that's something we'll only be able to tell at the end of the season, depending on what we've won or haven't won. I'm confident we'll be winning important trophies this season and the players relationship with Ancelotti couldn't be better. Everything is going the way we want and I'm also very fortunate to be in a great moment of form", analyzed the Real Madrid forward. Cristiano Ronaldo next game for Real Madrid is a league fixture against Rayo Vallecano, scheduled for next Saturday, the 8th of November. You can watch Juventus live stream, Real Madrid vs Rayo Vallecano, Almeria vs Barcelona, Everton vs Lille, Asteras Tripolis vs Tottenham, and Wolfsburg vs Krasnodar, all matches provided from our live streaming game pages.